NickName: "The Land of the Midnight Sun"
Land Area: 570,833 sq. mi. In 1867 U.S. Secretary of State William H. Seward bought Alaska from Russia for $7.2 million. Oil is Alaska's main source of income. US bought Alaska from Russia over 100 years ago for less the 2 cents an acre. Alaska is the largest state but has the fewest people per square mile. Alaska is home to Mt. McKinley. At 20,320 feet it is the highest mountain in the US. It is home to Moose, Elk, Caribou, Bears and Mountain Goats. Glacier Bay National Park (17 Glaciers) near Juneau. 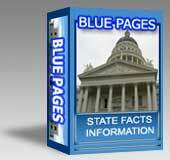 Blue Pages - US: Agencies, Associations, Boards, Bureaus, Business and Economy, Centers, Commissions, Councils, Departments, Education (+Higher Edu; Colleges and Universities), Employment & Labor, Federal, Foundations, Government, History, Law, Legal, Justice, Legislative, Libraries, Offices, Organizations, Services, Web Sites.